The Exerpeutic 900XL Recumbent Bike is a sturdy and popular bike in the budget recumbent exercise bike range. A low-cost and basic setup, it doesn’t have a ton of bells and whistles besides the heart rate monitoring in the handgrips. But what the Exerpeutic 900XL Recumbent Bike does have is a durable and user-friendly design that allows you to step through the machine to get on and off, a 300 lb weight limit to accommodate bigger users, and even though it only weighs in at 63 lbs, this machine has a low center of gravity and extended leg stabilizers to keep it in place during your most intense workouts. It also has a nice oversized padded seat and large pedals to accommodate a wide range of users. We’ll cover the rest in our full recumbent bike review below. Click here to see the lowest price on the Exerpeutic 900XL Extended Capacity Recumbent Bike with Pulse. Three (3) year warranty on frame. Shipping cost for the Exerpeutic 900XL Extended Capacity Recumbent Bike with Pulse will vary in price depending on where you purchase from and what type of delivery you prefer. However, if you purchase through Amazon.com, shipping is free for this machine. The Exerpeutic 9000XL comes with a step-by-step assembly manual. Assembling this bike seems to be hit and miss. Some users claim it was very straight forward, other say it was challenging. We think that on average, it should take around an hour and a half to get the recumbent bike together. Exerpeutic sits under the Paradigm Health & Wellness umbrella of brands. Based in Southern California, Paradigm Health & Wellness is a respected manufacturer of fitness products. They make a plethora of exercise equipment including treadmills, exercise bikes, recumbent machines, elliptical, inversion tables and playground equipment under various brands including Progear Fitness, Fitness Realty, Ironkids™, Ironman® Fitness, Exerpeutic Therapeutic Fitness, Workfit™, and MyCloudFitness. 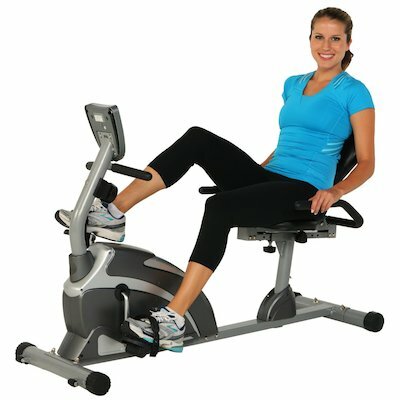 The Exerpeutic 900XL Extended Capacity Recumbent Bike is a nice bike for this price range. It is however as very basic model as are most bikes under $200. This recumbent bike has a nice design to accommodate a wide range of users. Hand grip style heart rate sensors are a handy way to check how your cardio workout is going. The fact that a budget recumbent bike has this feature is unusual and a big plus. The Exerpeutic 900XL Extended Capacity Recumbent Bike has a thoughtful design to make you want to use this bike as much as possible. It has a nice step through design so that you can get on and off the machine easily. Its low center of gravity and extended leg stabilizers to keep the bike in place during your most intense workouts. It also has a comfortable oversized seat and back rest. Finally, the 900XL Extended Capacity Recumbent Bike is equipped with large foot pedals to accommodate a wide range of users. This bike is designed very well. Again, this is a very low-cost recumbent that isn’t going to have all the fancy features of a higher priced bike. On the bright side, lately it seems that Exerpeutic has addressed some earlier quality concerns with the 900XL. Previously, some users reported issues while others with squeaky parts, but there have been few complaints recently. Our recommendation would be to make your purchase from a reputable dealer or Amazon.com, just in case you run into issues yourself. The Exerpeutic 900XL Extended Capacity Recumbent Bike only has eight (8) levels of resistance. This makes it challenging to tailor a resistance to your individual fitness level. Another down side of the resistance on this recumbent bike is that they must be manually set, but this is pretty common in this price range. As is no pre-programmed workouts. The Exerpeutic 900XL Extended Capacity Recumbent Bike comes in at a budget price and as they say, you’re getting what you pay for. But that does not necessarily mean low quality. It’s a very standard while very effective fitness machine. Its big brother, the Exerpeutic 1000 High Capacity Magnetic Recumbent Bike is also worth a look and isn’t a whole lot more expensive. Hi Dave, I spoke with Paradigm (makers of Exerpeutic) and they said the Exerpeutic 1111 is just the 900XL under another name. Here’s a link to that manual (click here).